The trek for a big billy is not for the faint of heart. I was about 15 when I saw the photo, tattered and faded, of my father and his cousin surrounded by snow-capped granite peaks and scree-strewn moraines. I Thought about that conversation as I rechecked my equipment in preparation for my first mountain goat hunt. Times had surely changed. The ultralight KUIU pack, complete with stove, shelter, titanium cook pot, freeze-dried food, down sleeping bag, first aid kit, and assorted hunting gear, tipped the scales at 18 pounds, 8 ounces. My Kimber Mountain Ascent added another five pounds, the Leupold scope another 15 ounces. I was thankful for modern technology even though it meant a departure from the old and classic. I had put in for mountain goats for decades and received nothing but rejection notices for the effort. One day, shortly after my 40th birthday, I had a sudden realization that the mountains were getting steeper, the climbs more painful, and if I waited much longer to hunt goats, getting deep into the backcountry might become problematic. Goats, like no other North American species, represent a young man’s sport, and with the passing of each fall, this “young man” was slipping solidly into middle age. Unlike sheep, which have become the realm of the wealthy, goat hunts, while not cheap, can still be booked with some diligent saving. Living in Montana, British Columbia was the closest and easiest option for me. A two-hour drive north of Kalispell, Montana, puts you into some excellent goat country. I could drive there, bring my gear, avoid the airlines, and bring back a goat with all the meat—if I was lucky. I had hunted this region for elk before, and I had seen numerous goats. 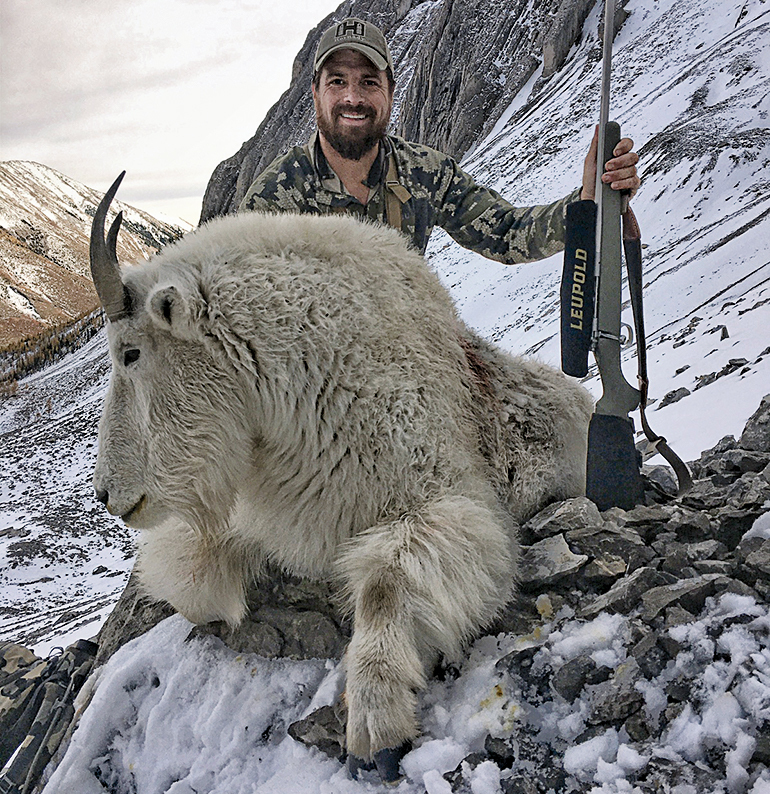 A few quick calls got me in touch with Ryan Damstrom, at Bighorn Outfitters, who had an opening left for the following fall. Dates were reserved, deposits paid, and the waiting began. Shortly after arriving at Bighorn’s base camp outside the sleepy little town of Elkford, British Columbia, we were saddling horses, loading mules with panniers, and hitting the trail. The path climbed through an old clear-cut, switching back and forth up the ridge to a saddle that would carry us to a valley on the far side. Late afternoon turned to evening. When the sun dipped behind the jagged peaks, I wondered when we would arrive at camp. Darkness would be on us pretty quickly. Conversation while riding is almost impossible, so I wasn’t sure how far we were going or when we would arrive. Would this first night find us on the cold ground in tents or on a cot in the relative comfort of a wall tent? The latter would be a pure luxury—especially on a mountain goat hunt and was more than I dared to hope for. I decided to mentally plan for the worst: sharing a tiny, leaking tent pitched on a steep grade covered with rocks. And then I smelled it: the unmistakable, distinctive aroma of wood smoke. My hopes soared. The trail opened up through the thick firs into a picturesque mountain meadow. I was shocked to find two well-made, if older, cabins, smoke rising from their tin stovepipes. A far cry better than a wall tent and a night and day difference to my father’s fly camp high in the Cascades. Camp Grizzly had been built in the 1950s. The original cabin, with its hobbit-sized doors and bear-resistant coverings on the windows still stood but sagged noticeably and was quickly being reclaimed by the harsh sub-alpine wilderness. 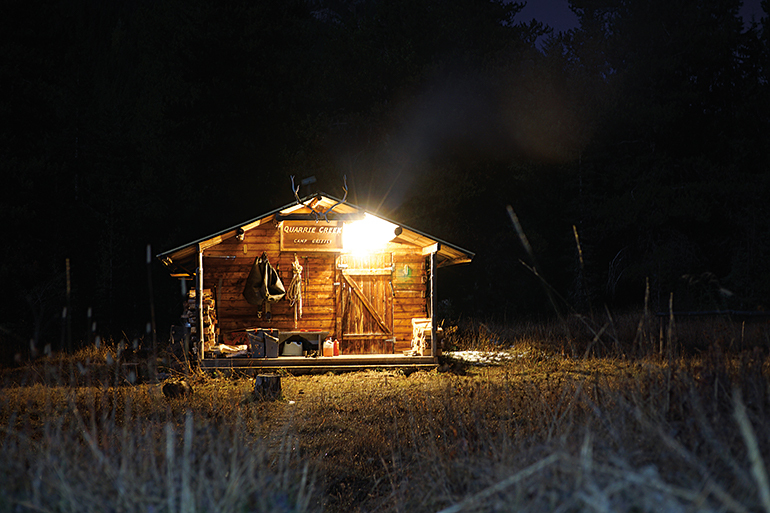 In the 1990s famed outfitter and international hunter, Bob Fontana, bought the con-cession and built two new cabins. He wouldn’t run the operation for long; he was killed on a Cape buffalo hunt in Tanzania in 2004. It was then run by Anna, his wife. The current owners are Ryan Damstrom and Sam Medcalf. After unloading panniers and removing saddles, we turned the horses loose in the corral before we entered the main cabin. The heat combined with the cooking smells rising from the old wood stove was a welcome respite from a night that was quickly turning cold. A cup of coffee and a quick meal got my attention first before I examined the walls of the cabin that served as guide quarters and dining hall. Over the years, hunters had all taken their turns telling their tales on the walls. It was a living history of the area. “December 21, negative 35, no fur,” wrote one trapper. Wondering whether he meant -35 Celsius or Fahrenheit seemed rather pointless. “Excellent hunt, one Grizzly and One Sheep,” wrote another hunter from decades ago. 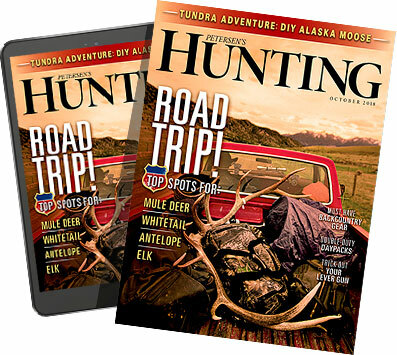 A successful story of a bighorn hunt caught my attention. It was signed by Steve Hornady. “Fitting,” I thought, since I was shooting some of his namesake ammunition. I wondered if my entry would be a tale of woe or joy after a week in these mountains. “So, it’s called Camp Grizzly for a reason, I would guess?” I asked. Having hunted this region a couple of years earlier and seeing more grizzly sign than anything else, I could only imagine. “Yeah, there’s a pile of grizzlies around here,” Ryan confirmed. “But mainly in the spring. We don’t generally have a problem with them in the fall, as they get out of this high country. But in the spring, watch out. The country is plain covered up with them.” I should have known with a comment like that it would be only be a matter of days until we had our first grizzly encounter. Predawn the following day the fires roared to life in the old tin “puffer” stoves. Horses were saddled by headlamp, a quick breakfast consumed, and then Ryan and I hit the trail. The size of the country was beginning to sink in. Even camping in the heart of it still put us nine to 12 miles from the hunting grounds. Then it would be a couple of thousand vertical feet up to the steep cliffs and hanging valleys the goats called home. It was a far easier and far more comfortable hunt than my father had experienced, but it was by no means easy by most hunting standards. Dismounting at the head of the daunting mountain cirque, we tied our horses to the last remaining trees, shouldered packs, and started hiking. My lungs ached after the first mile, burned at the second mile, and stayed mildly uncomfortable the rest of the day. Progress was measured in feet, gained slowly, and when lost temporarily, it was with a heavy dose of regret. We saw goats that day, but only nannies, kids, and a pair of young billies. At dark we saddled up and rode out in the inky blackness as the little heat of the day escaped into the high altitude’s thin air. By the time we reached the warm glow of the cabin, pumping smoke through its chimney, the stars were bright and the temperature had fallen well below freezing. The second day broke colder than the first, and we decided to take the opposite fork up the valley to scout some new country and possibly locate an old billy on his own. By midmorning the sun was out, warming the valley floor, and the hoarfrost glistened on the long grass. My horse nabbed mouthfuls of it every other step. I knew it was poor horsemanship to allow it, but the morning was so peaceful and right it didn’t seem to matter. All of the sudden, my horse stopped mid-bite, head shooting skyward and staring cockeyed in front of us. There in all of his glory was a grizzly, not 40 yards away, guardhairs catching the morning sun. The understatement of the trip. As the adrenaline dump from the grizzly encounter subsided, we stopped farther up the valley and set up spotting scopes, looking across wide-open vistas to peaks in the distance. As late afternoon approached, we spotted a couple of billies in a far distant rocky basin. Too late to go after them, but if they stayed put, tomorrow may be a different story. The following day, we left in the dark and rode straight to the basin where we had seen the goats. The sun was well up and hitting the canyon floor when we tied horses and shrugged on packs for the upcoming hike. Crawling up to a small knob that would afford a decent vantage point, we hadn’t glassed for a minute when two white specs stood out from the gunmetal-gray rock a thousand yards distant. They were our two billies—nestled into the rocks, bedded for the day. We snuck off the knob and out of sight to make a plan. The billies were in a good strategic position—for them, not us. For roughly 600 yards all around them there was no cover—save for a small crick drainage that may hide an approach. With no other choice, we decided to give the route a go. Hunkered down into a half-crouch, we stayed in the lowest portion of the valley floor and maneuvered our way closer. With every step I expected to hear clattering rocks and see the two billies squirt out of the basin. When we finally had covered several hundred yards, we chanced a peak over the rocky bank. The billies were still bedded, completely unaware of our presence. A quick check with the Leupold RX-1200i TBR rangefinder showed they were 472 yards away. Some riflemen would set up there. The Kimber chambered in .280 Ackley Improved and stoked with Hornady Precision Hunter cartridges was more than capable of delivering the killing blow, but I thought we could get another 100 yards closer by crawling. And for every yard gained, I knew the probability of a successful hit and a quick death increased. We ran out of cover a bit shy of 100 yards. Lying prone, I rolled out of my pack, pushed it in front of me, and rested my rifle across it. The rangefinder read 387—not a lot closer, but mentally “under 400” sounded far better than “nearly 500.” The largest of the two billies was not spooked, but his sixth sense was definitely aroused. He knew something was not right in his otherwise normally peaceful valley. Digging my elbows into the sharp gravel, I rechecked my drop and settled in, waiting for an opportunity. I didn’t have to wait long. Without warning, the billy rose from his bed, stretched, and looked down the valley, presenting a perfect broadside shot. With no wind to correct for, I settled the crosshairs on his upper shoulder and broke the shot. He immediately went stiff, seemingly locked in place, but still stood. The sound of the impact reverberated back through the valley, and I knew the hit was good. Starting to cycle the rifle for a follow-up shot, I stopped before the second cartridge was seated home and watched him topple off his perch and roll down the snow chute. 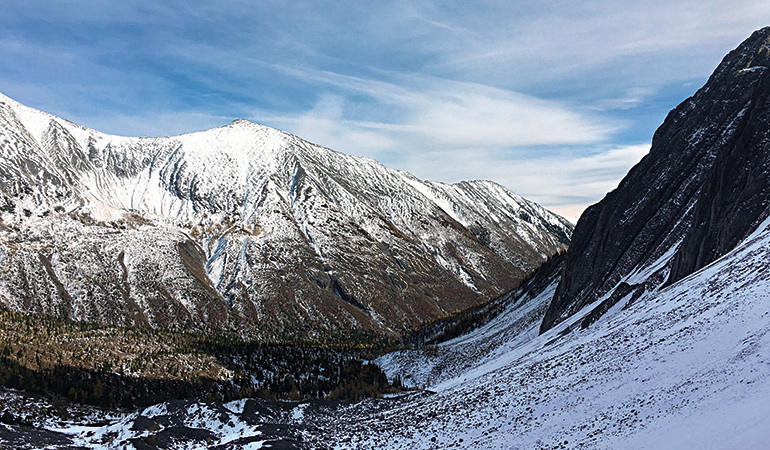 By the time we got to the billy, took a few photos, and started getting out knives for the skinning job, the short autumn day was already waning, slipping behind the western ridge, casting the upper peaks into shadow. It would be less than an hour before the valley was out of the warmth of the sun. We set to work skinning and quartering the stocky animal—the meat going directly onto the clean snow to cool, steam rising up from each piece as soon as it was thrown down. The meat was pinkish-red, not as dark as deer or elk venison, and it did not have the “goat” smell I had anticipated, but by far it was the toughest, densest meat I have ever put a knife to. I knew it would taste fine, but a slow cooker was going to be in order. Head, full skin, backstraps, and front shoulders went into one pack, both rear quarters into the other. It made for two heavy loads getting off the mountain. While one would assume a horse ride out would be a welcome respite, we had neglected to bring a pack horse, so we rode with full packs the eight miles back to camp, each step compressing our spines. When we finally arrived at camp well after dark, we were so stoved up we had to have help getting our packs shucked and lifted off the horses. While I can’t compare the physical hardship to my father’s hunt 50 years before, it was enough. Hiking, riding, and ultimately packing a goat out of goat country is always enough—no matter how “easy” it is.